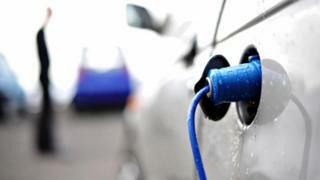 The use of electric car charging points across Scotland has more than doubled in the last year. Chargers were used 26,119 times during August, up from 12,939 in August 2015 and nine times the usage in August 2014, ChargePlace Scotland said. Electric vehicle drivers appeared to favour rapid charge points, with many standard charge points not used at all. Rapid chargers - which make up 18% of the charging total - can charge cars up to 80% in half-an-hour. Steve Gooding, director of the RAC Foundation, said: "They say that when it comes to buying a house, location, location, location is everything. "So it goes with electric charge points. Facilities need to be in places where people will use them. "But there's something more. The evidence suggests that it is rapid chargers that are getting a disproportionate amount of use, which bears out the view that improving the convenience and speed of 'filling' up with electricity is mission critical to the wider take-up of these vehicles." WWF Scotland director Lang Banks said: "Independent analysis has shown that for Scotland to meet its future climate change targets, one in three cars, and half of all buses, will need to be electric by 2030, in line with the long-term need to phase out fossil-fuel vehicles entirely. "The Scottish government's forthcoming energy strategy and climate action plans provide the ideal opportunities to bring forward the policies needed to deliver such a transformation."